In the weeks before I made the final decision to put my sweet Schuyler to sleep, I wasn’t eating enough, according to Jon. My stomach was a mess, my anxiety was building, and I was in a constant battle with my cat to get her to eat. It was no surprise really that my dining habits mirrored hers. During the five years we spent together, Sky and I watched each other’s every move in our small apartment. If I was on the couch she was in my lap, or if my laptop was there instead, she was curled up next to me just close enough that we could feel each other’s warmth. If I was asleep, she was asleep on top of me, my hand under her chin. Her litter box was near the toilet, so we often faced each other eye to eye, or eye to cat bottom, as we did our business. 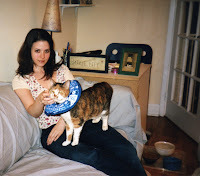 Schuyler’s last health crisis was an undiagnosed stomach problem that caused her to lose a lot of weight, but her main health issue stemmed from severe allergies that eventually forced her to wear an e-collar all the time. As her allergies increased, I learned to expertly administer shots, pills, sprays, ointments and baths, and put her on a hypoallergenic diet prescribed by her veterinary dermatologist. At her last vet visit, her doctor told me I needed to switch her to store-bought food again to help her gain back the weight. A month later, I let the vet know my heartwrenching decision. I always believed I'd have to make a choice of quality over quantity for Sky, but I never would've guessed the time to choose would come so quickly. In our last few days together, my appetite came back in overdrive and Sky and I ate like queens. She gobbled down bowls of salmon and lobster flavored cat food, drank fresh water every hour, and finally got her own can of Jon’s tuna, which she always begged for when he made tuna melts. My first indulgence was a bottle of red, a carton of Chubby Hubby, and (after I realized that all of my comfort cravings involved leavened foods and accepted that this was not going to be a year for keeping Passover) a delivery of Crawfish Mara from Mara’s Homemade. Jon and I ate there on Valentine’s Day, and I’d since been dreaming about another steaming bowl of the creamy, slightly spicy pasta dish. The crawfish, which Mara’s only purchases from the Gulf Coast, had a musty, of-the-earth, seasaltiness to them that reminded me of my coastal roots. And who isn’t comforted by cream sauce? Two glasses of wine, ¾ a carton, and many mouthfuls of pasta later, I wasn’t satisfied, though on any other night I would have been perfectly sated. Over the next few days, nothing, not even copious handfuls of Cadbury Mini Eggs stolen from Jon’s secret stash, a Shake Shack burger and their Nutter Butter custard, sushi from the LES Whole Foods’ revolving sushi bar, pizza with clams from Three of Cups (where Jon and I had one our most memorable first dates), more red wine and a few Dark & Stormies, Arepas and a Papelon Con Limon from Caracas, Bangers and Mash from Puck Fair, chocolate cake, more Eggs, or (natch) Comfort Diner’s dreamy Blueberry Lemon Ricotta pancakes, could satisfy my hunger. I woke early and hungry on Schuyler’s last day and heated some instant grits. She finished the last few bites of her tuna just before it was time to go. Many tears, sweet nothings, kisses and goodbyes later, Jon and I left the vet’s office stunned. And I was hungry again. We walked around the corner to The City Bakery, a beacon of comfort and familiarity. Over a cup of their rich, thick hot chocolate and a bowl of vanilla yogurt with crystals of ginger, topped with sour cherries and lychees, a sense of relief coupled with raw grief began to set in. I miss her terribly, but I know I made the right decision. And from now on, whenever Jon makes a tuna melt, I'll have a little bite for Schuyler. she's in a better place, but we miss her!